Where did the Quick Time Event go wrong? The ubiquitous Quick Time Event, something that defies nature but somehow manages to capture our hearts for better or worse. How did we start to see these magical interactive instances in our precious video games? Where did it go wrong? 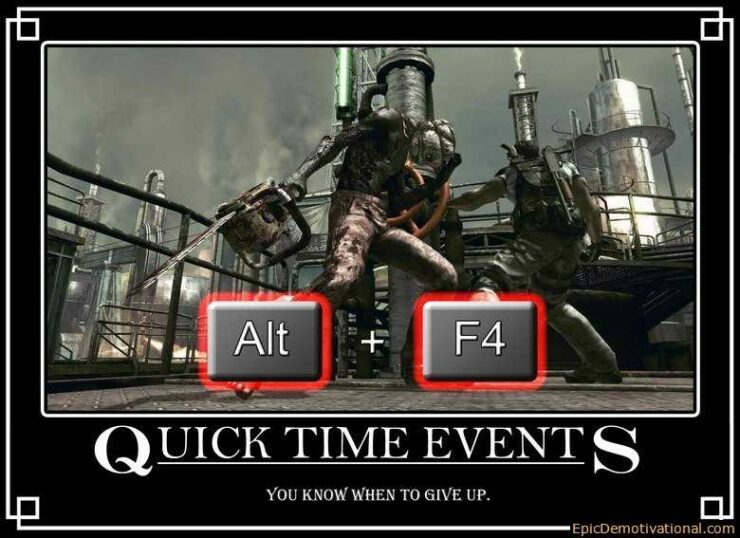 We all know what that blasted Quick Time Event is. It’s the pustule of the gaming industry, showing up at the most inopportune of times and distracting you from the very heart of the game, destroying any enjoyment you may have had. At least, they mostly distract from the actual content. The QTE, as it’s abbreviated, has both positive and negative feedback. In some situations it can enhance, while in others it’s just a nuisance that makes you want to punch your monitor or throw your controller into the wall. So where did the QTE go wrong? From it’s very inception. The QTE was a horrible idea right from the beginning. The Quick Time Event, in some form, has been around for longer than you might think. Originally the idea was used in interactive laserdiscs as a means to keep interest. The original Dragon’s Lair is perhaps the earliest example. In Dragon’s Lair you controlled the hero precisely by pressing buttons on the remote at specific times while watching the disc. It was an interactive movie, thus the QTE was a cinematic control device. Isn’t that a horrible idea though? It doesn’t add any real control to the “game” and it just takes away from enjoying it. You have to concentrate on pressing the buttons more than on what’s actually happening. It took away from the enjoyment. It flat out ruins the experience. Forcing interaction is a sign of poor story-telling. The modern Quick Time Event, as we know it, came about from a very memorable game; Shenmue. 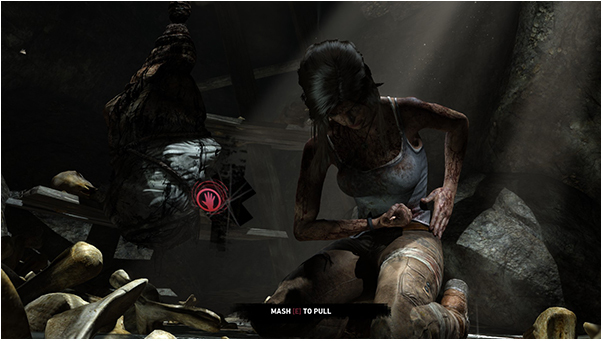 In it, the player can press certain buttons when prompted during a cut-scene to execute relevant actions. Dodge, roll, break out of a head lock, those types of things. Yu Suzuki of Shenmue fame is the one who actually coined the name. His intention was to help blend the cinematic with the usual gameplay to let gamers interact with those increasingly popular cut-scenes. 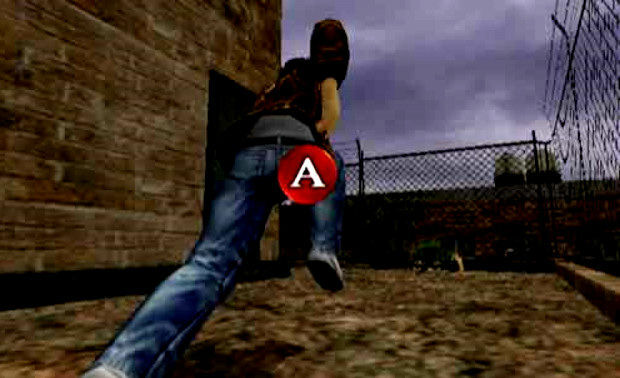 Instead of simply watching the prolonged and boring cutscenes half-heartedly, you could actually be a real part of it! For Shenmue, it worked. It was a nice way to add a little bit of choice to those moments that are usually controlled. It worked quite well for that game actually, and it’s still heralded as one of the greatest games of our time. The problem, however, is that developers are taking this button mashing mechanic and making it part of moments in the game that are just inappropriate. Forcing you to perform an action in exchange for simply continuing the game, and they end up being a poor fit for what’s going on. They can sometimes lessen the emotional impact of the scene, stripping away the very reason we’re playing the game. 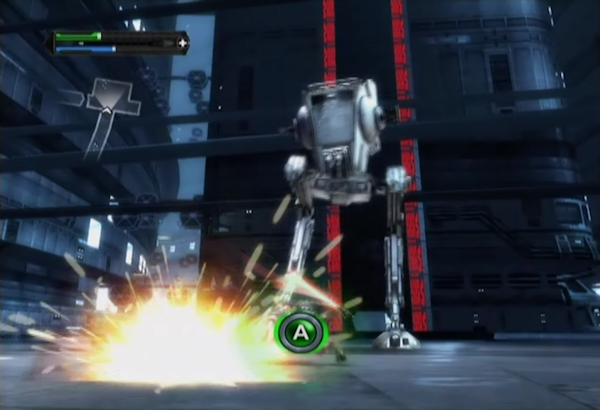 In Star Wars The Force Unleashed and its sequel I remember being particularly frustrated when I learned that the buttons to press changed every time, and sometimes glitches caused the opportunity to pass far too quickly. 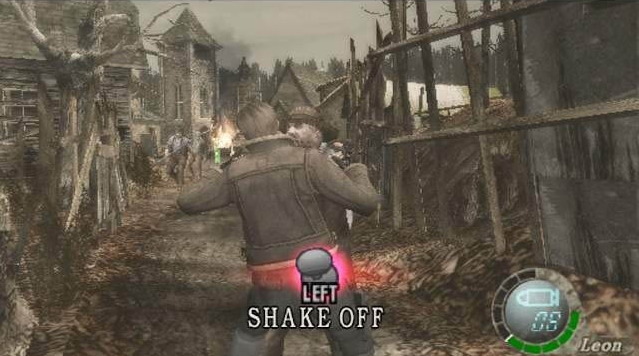 Resident Evil 6 showed us again how poorly utilized the QTE can be. Instead of using a natural idea and translating it into action, they had us jumping out of the way of trains with the buttons that were for running and reloading. Why? Oh dear, why? Dying Light’s boss battles are riddled with QTE’s, ruining the ending and making it more frustrating than it’s worth. 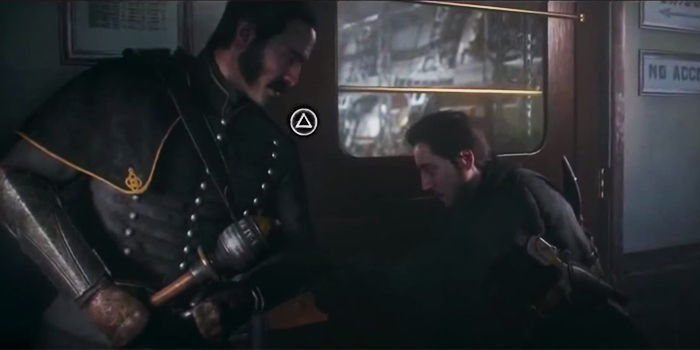 The Order 1886 is perhaps the embodiment of horrible Quick Time Event’s. Despite have a great story, the proliferation of Quick Time Event’s can frustrate even the most patient of players. Moving an object along the way? Mash X as fast as you can. At a critical junction an the screen suddenly becomes grey? Move that joystick to unlock the button you have to press, but be quick about it! Wanting to perform that sweet stealth kill? Better wait for the button overlap, but again, be very quick about pressing that button. Oops! Missed it. But they have their good moments too. When they are used right, they do add a certain value, and are best left to tense moments where you’re already enthralled by what’s happening, placing the QTE in an appropriate atmosphere. You can’t just place them all willy nilly like, they need to have context. Elder Scrolls Online allows you to press a combo of buttons to escape certain effects, and this generally works well. 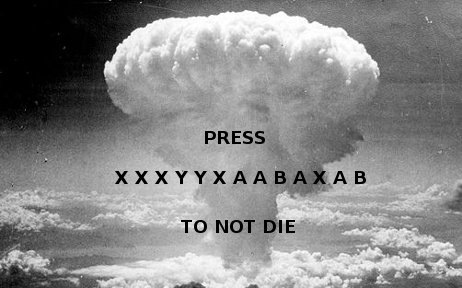 Though this is a button press while in game, not necessarily a QTE. In God of War, for example, they aren’t mandatory by any means. 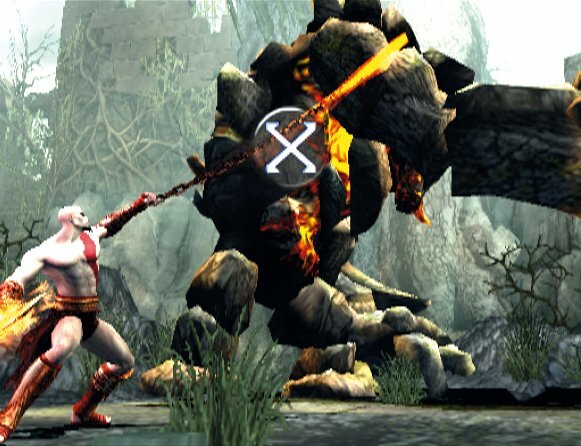 Mash the correct button only if you want to see Kratos be more violent than he already is. Mass Effect is perhaps the best example of how to use the QTE. 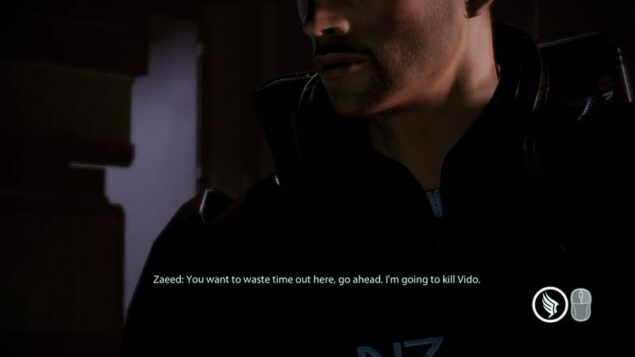 During key dramatic cutscenes you’ll have a choice to perform actions that determine your morality. Those choices have an effect on what conversations are available to you, though those actions are not mandatory to the game. But they the QTE was a horrible idea right from it’s inception. It offers little sense of control or interactivity and they really don’t add anything to the gameplay. Even when done appropriately it might be better to leave them at the door. In fact, instead of interacting with cutscenes with QTE’s, perhaps developers should focus making games that we actually get to play. 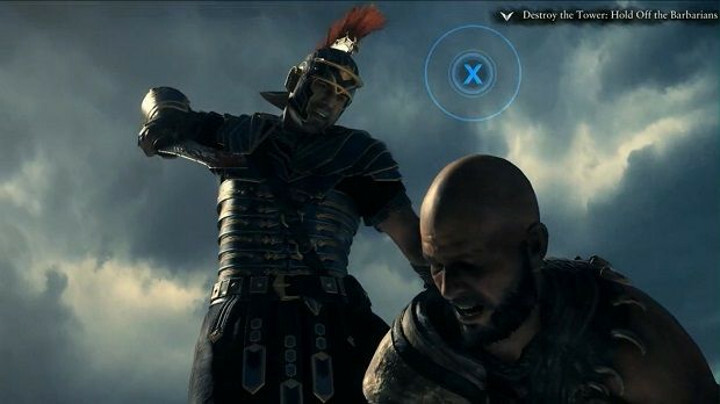 Cinematics are fantastic, but video games need more gameplay and less places where we watch. Even with the limited QTE interaction. I want to play games, not watch them. The QTE is an abomination.